This is the time of year that I try to give an overview of the auction of antiquities on the New York market (see January 2017). 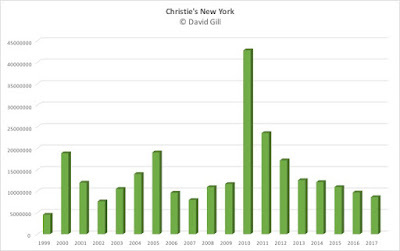 This year I am only returning the sales from Christie's in New York. This is the seventh year of decrease for the sale of antiquities, and the value for 2017 ($8.6 million) is only slightly better than that for 2007 ($7.9 million). 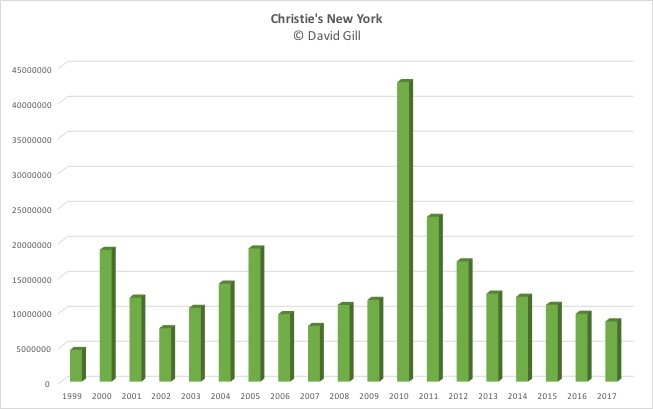 This is perhaps reflecting the move of the sale of antiquities from New York back to London, worth some £7.5 million (between Christie's and Sotheby's).